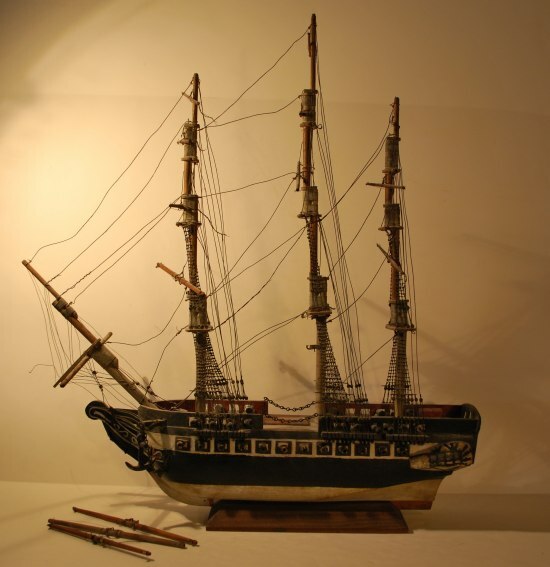 1922 Frigate Model - Model Ship Repair and Restoration. 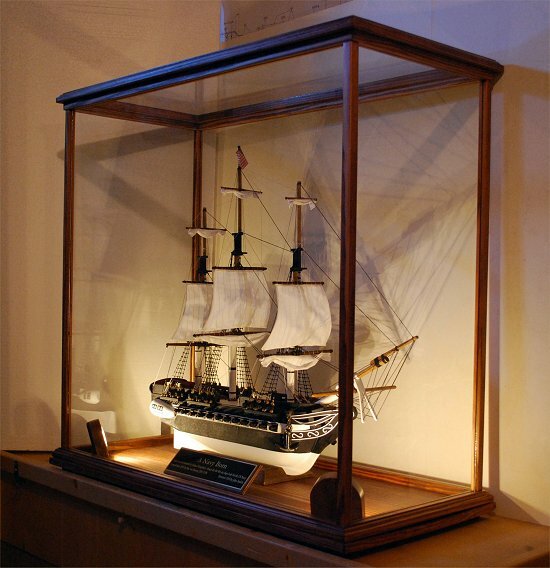 The project consisted of the restoration and repair of a model based on Joshua Humphreys' designs of the first six ships built for the U.S. Navy. The model was built around 1922 by a Grandfather while he served in the U.S. Navy and is being passed on to his Grandson and namesake, who is currently serving in the Navy. The model was in severe disrepair and had to be completely disassembled. The use of iron nails in her original construction had cracked the wood in several locations and moisture had also gotten into the model. Some parts such as several cannons, rudder and sails were missing from the model. The gun port lids had completely disintegrated. The hull was made from a solid wooden block but some materials used for the tops and decorations still have me guessing as to what they possibly could have been made of? The image below shows the completed repair and restoration project. Care was taken to use as many of the original parts and materials as possible and to make new parts such as cannons match the original cannons. Battle sail configuration was chosen and a new set of sails and rigging was created. The deck had quite some moisture damage and was cleaned, refinished and re-planked. To prevent the model from decay, dust and moisture in the future, a custom Douglas-fir display case matching the model base was built to protect her. The base and display case were both stained in red oak and varnished to a satin finish. Quality low heat and low voltage LED spot lighting was also added to the case and the lights were carefully positioned and angled to create optimum highlight and shadow effects. The model has grown on me tremendously. I think you'll agree that she makes a wonderfully warm and interesting display.